The final round of the National Golden Waistcoat Grand Finals were held at Haverhill Snooker Club on Sunday 24 July The line-up was very strong with some of the best amateur players in the country fighting it out. Mike King (Exeter) made it a golden double by beating Jamie O’Neill (Wellingborough) 3-2 in the Final to become the National Golden Waistcoat Finals Winner to add to his title of West of England Regional Gold Waistcoat Tour Champion run be the West of England Billiards & Snooker Foundation (WEBSF). King narrowly failed to make it a golden treble by just 40 ranking points to Geoff Williams (Birmingham) the overall series winner, Williams collected £50 prize money and a trophy to go with the overall title. King said that if it wasn’t for the Golden Waistcoat, to which he is prepared to travel all over the country to attend, and now the WEBSF Gold Waistcoat Tour in the South West he would have no good Tournaments for match practice as he is now too old for a lot of the competitions. Mike took some impressive scalps on his way to the Final the competition must be fierce down in the South West beating Main Tour player Adam Davies in his Last 16 match and two former Challenge Tour players Lee Page and Jimmy Robertson in the Quarters and Semis respectively. Mike picked up the Winner trophy, prize money of £220 and his name will be added to the Anne Helliwell Memorial Shield along with that of Geoff Williams and all the previous Series and Finals winners. Frank Helliwell (Pontefract) along with his dear wife Anne, when she was still with us, have been the greatest supporters of the Waistcoat over the years but Frank has decided to hang up his gloves after the Silver Waistcoat Finals in Birmingham on 14 August 2005. Frank is well known on the circuit by “old” pros and the new young juniors alike, and we would like to thank Frank on behalf of everybody for all his hard work in snooker and wish him a very happy retirement. His quiet, unassuming refereeing style and the encouragement and wisdom he imparts to the younger players will be sorely missed. On behalf of everybody involved with the Waistcoat, Frank was presented with an engraved silver tankard and cigarette lighter. In Group A Alan Hooper, Lee Page , Alex Dunkley and Geoff Williams qualified for the knockout stages. Williams, the series winner, was having a bad day and had to win the last group match against his club mate Alan Hooper to prevent the Silver Waistcoat Series winner 12 year old Mitchell Mann, who had beaten him in their group match, from taking the last qualifying spot. In Group B Adam Davies, Charlie Walters, Lewis Roberts and Bash Maqsood qualified with Main Tour player Adam Davies the only player to win all his matches. In Group C Jamie O’Neill, Jimmy Robertson, Jimmy Croxton and Matt Redding qualified. O’Neill won all his matches and there was a three way playoff for the final qualifying spot between Matt Redding, Michael Wasley and Brett Hall with Matt Redding taking it by 3 points. In Group D Greg Batten, Alex Davies,Matt Barnes and Mike King went through in a close group. The closest Last 16 match was between Jamie O’Neill and Geoff Williams with O’Neill just coming through to take the match 3-2 with the rest of the matches either 3-1 or 3-0. In the Quarters Alan Hooper saw off Matt Barnes and had a break of 73. Again O’Neill had the closest match of the round against Alex Davies. In the decider Davies potted a long red but went in off and O’Neill notched up a break of 73 to take the match 3-2. King knocked out Lee Page with breaks of 60 and 50 and in the last frame was 23 behind with 18 on. King got the snooker and cleared the colours for a re-spotted black which he doubled to take the match 3-1. Robertson took care of Greg Batten, who had looked to be cruising all day having beaten both Alex Davies and Matt Barnes 2-0 in his group matches, with a break of 67. In the first Semi O’Neill put in enough breaks in each frame finishing with a 68 in the last to despatch Alan Hooper 3-0. In the second Semi Robertson conceded the first frame after being snookered by King. In the second Robertson had a bit of bad luck when splitting the pack and missing a couple of pots he would normally pot to go 2 down. In the third Robertson made two decent breaks to keep the match alive but in the last frame with Robertson in front King made a great clearance of 43 to win the frame and the match 3-1. In the Final King got the first two chances but went in off on both. O’Neill looked to be on for a sizeable break but got a kick but King could not capitalise on this chance and let O’Neill in to clear to the pink to take the first frame 62-37. In the second frame King opened with a great long red to the green pocket and scored 33 missing a pot on the brown. He got another chance later in the frame and took it snatching the frame 63-35. In the next two frames the honours were shared to take the match into an exciting decider. The final frame was a very tactical affair and after many safety shots from each player 9 of the remaining 12 reds and the pink were in the baulk end. O’Neill missed a red to the middle and King potted 8 reds with colours for a break of 52. O’Neill potted a red and played a great shot to get down for the black which he potted to score 8. With the three remaining reds on the side cushions O’Neill played safe but was then snookered by King. King potted the last 2 reds and O’Neill conceded the frame and the match 3-2. A great performance by Mike King and hopefully his 4 hour trip home was happier for lifting the Golden Waistcoat Grand Finals Winner title and trophy. It was a fabulous day of snooker with over 40 breaks of 50+ and centuries, with Jimmy Robertson taking the £50 and trophy for the highest break of the day with his 135 against Michael Wasley in their group match. Jimmy Robertson 135,106,67,67,63,55 Bash Maqsood 104 Greg Batten 94, 86,71,70,73,54,53 Lee Page 93,59,55 Jamie O’Neill 87,76,73,68,66,58 Jimmy Croxton 81,57,51 Mike King 79,70,68,60,52,50,50,50 Matt Barnes 77,68 Alan Hooper 73,72,63,60 Alex Davies 72,70 Alan Moore 68 Lewis Roberts 65 Matt Redding 67 Brett Hall 66,63 Charlie Walters 61 Alex Dunkley 56 Geoff Williams 53. LAST 16 Alan Hooper (Birmingham) bt Matt Redding (Gloucester) 3-1, Matt Barnes (Clacton-On-Sea) bt Charlie Walters (Orpington) 3-0, Jamie O’Neill (Wellingborough) bt Geoff Williams (Birmingham) 3-2, Alex Davies (Clacton-On-Sea) bt Lewis Roberts (Stamford) 3-1, Lee Page (Kidderminster) bt Jimmy Croxton (Stoke) 3-1, Mike King (Exeter) bt Adam Davies (Clacton-On-Sea) 3-1, Jimmy Robertson (Bexhill-On-Sea) bt Alex Dunkley (Southampton) 3-0, Greg Batten (Exeter) bt Bash Maqsood (Nottingham) 3-0. QUARTER FINAL LOSERS £25 and TROPHY Hooper bt Barnes 3-1, O’Neill bt Davies 3-2, King bt Page 3-1, Robertson bt Batten 3-1. SEMI – FINALS LOSERS £70 and TROPHY O’Neill bt Hooper 3-0, King bt Robertson 3-1. Our thanks to Keith and Hazel at Haverhill Snooker Club for the use of their superb facilities and their support over the years for the WAISTCOAT and thanks again to Frank Helliwell for officiating for us. As mentioned before we are not intending to continue THE GOLDEN WAISTCOAT RANKING EVENT this coming season due to the reduction in numbers attending we don’t know what the answer is. We thought we had the answer at the start of this season in splitting the GOLDEN/SILVER Waistcoat events and throwing the Golden open. We envisaged having enough older, better players for at least three regions throughout the country to ease the travel for the majority of players. Being as there was to be no Challenge Tour we thought players would be looking for quality match practice against quality competition. The reasons we have been given for not attending are varied but mostly boil down to two main points the tables and the travelling. 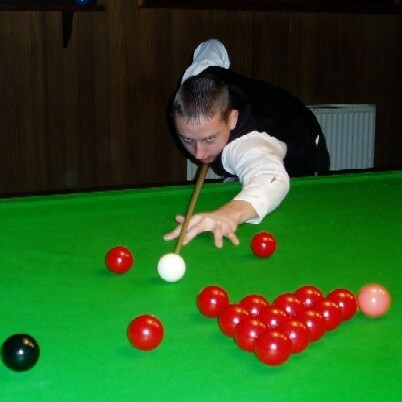 The more serious players are now used to playing and practising on heated match tables with fast cloths. With all the will in the world, and we know Haverhill, for instance, do everything they can to provide top quality match conditions with Aramith balls, they cannot provide 16 match tables to play on that is impossible and commercial suicide. At the Finals we were asked if the Main Tour players had to give a start to which the reply was no everybody plays off scratch and always have in the Waistcoat. When this was mentioned to a Main Tour player he thought that they ought to get the start as ‘club players’ had the advantage. The players are being spoilt by having such a great venue as Pontins, but not every competition can be played there and I fear for the future of the young players. We can remember, when Jamie started playing, attending Pro-Ams at ordinary clubs with 60+ entrants with a lot of the top players there that is where he learned his trade by getting whopped by these players on bad cloths with ‘light whites’. We are producing an elite band of snooker players who won’t play on club tables and won’t travel to support their sport as they have to travel possibly twice a month to Prestatyn and stay over and there is only so much money to spend on snooker events. There are plenty of events for junior players (U21s) but we are really bemused as to what the older players are doing for Tournament practice. As we have said we do not know what the answer is but we would urge ALL snooker players to support any Tournaments they can to encourage the sport and the players into the clubs to practise and to lobby WSA to get a dedicated venue, preferably in the middle of the country, as soon as possible. Having said all this, we are very pleased that Jeff Mann will be continuing his hard work in the Midlands and The SILVER WAISTCOAT ranking event will be starting in September 2005 watch out for the details and details of the new website Junior Snooker. Also, Roger Cole and his colleagues in the West of England Snooker & Billiards Federation are continuing with the Gold, Silver and Bronze events in the South West and may be expanding next season for more details visit their superb website WEBSF. There may be a possibility of a few WAISTCOAT OPENS throughout the season so please watch out for them in the snooker press, either of the above websites and we will try to get it on Global Snooker as well so watch this space!! Good luck to all you snooker players out there thanks for everybody that has supported us over the years and we hope you enjoyed it as much as we did. Bye for now! !